When I ask the question, “Do you know a missionary?” most people (Christian and not) answer: “No.” Most people think of a missionary as a Christian who goes on a long or short-term mission trip to dig wells or work with orphans in a developing country and convert people to Christianity. The truth is that ALL Christians are missionaries, wherever they live. However, many Christian men and women talk about how they don’t know how to do this in a practical way. I have spent the last decade as a Christian working in highly secular workplaces and wanted to share a few of the ways that I’ve learned to be missional at work. There seems to be this gross misconception within Evangelical Christianity that each and every Christian needs to be an evangelist. We know that each person is gifted differently but many of us feel the pressure to carry tracts or walk up to a stranger and present the gospel in a systematic way. Keeping your eyes on Jesus and what he wants from you while forgetting what everyone else might be expecting of you frees you to be able to love God and others without using them. This probably sounds obvious but for many it can be a challenge. A wonderful transformation occurs in the heart of a believer once it’s been filled with the Holy Spirit but what often happens is that as our heart is changed we surround ourselves with Christians and lose touch with how to relate to non-believers. Human beings are social creatures; even the most anti-social among us look for friends they can relate to and be loved by. I considered listing this as #1 because one of the most important parts of our at-work testimony is our integrity. Do you read the Bible to learn what God says is appropriate and then live that way, or do you present yourself as a Christian and live like everyone else? If you are open about being a Christian your coworkers are most likely watching to see how you react to stress, anxiety, frustration, anger, and conflict. Pray throughout your day and during these types of events so that your reaction will be a testimony to what God has done in you. Again, this one is obvious, but your coworkers are looking for a friend, not a preacher. You can still have lunch or go to a game with them while living YOUR life as God wants even if they don’t. Also, don’t judge your non-believing coworkers. This doesn’t mean you excuse their sin, but odds are they’re well aware of where you stand because they’ve likely had several others speak to them about it in the past (often times in a way that has hurt them). As friends your coworkers will want to hear your stories just as you’ll want to hear theirs. Don’t be timid about sharing your past experiences and what God has done for you. What it does is helps you to be relatable and humble to show that you aren’t perfect and don’t have it all together (because none of us do). Let them know you for who you are even if it’s not necessarily who you’d want them to see. Being missional, or mission-minded, means being focused on the mission that Jesus gave us: making disciples who know and do what God says. Being missional enables us to go through the highs and lows of work with a clear/focused objective. It helps to keep you from being confused and drawn away by whatever drama is happening in the workplace. There is a key difference between a mission and an agenda. 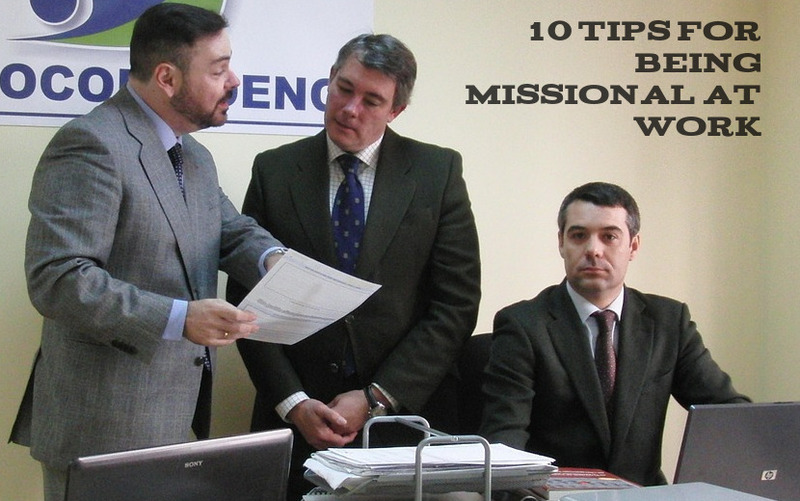 A mission is an overarching objective that is being worked toward, while an agenda is a detailed outline on how to complete that mission. The reason so many are turned off by Christianity is that they have been the subject of someone’s agenda, leaving them feeling used, judged, and/or betrayed. Life is a messy thing. Everyone makes mistakes but no one really wants to be identified with or by those mistakes. Being open and genuine about who you are, where you’ve come from, and what Jesus is doing in your heart makes you vulnerable and helps your coworkers to feel comfortable with you. Be a servant to all. Serve your coworkers in whatever way you can as often as you can. You don’t need to be awkward about it, just treat them the way that Jesus would treat them. Hold the door for them, say “please” and “thank you”, bring them some coffee, help out on a project or task without being asked to. This sounds a little pretentious, but seriously. Be a hard worker. Be honest. Care for your work, your customers, and your coworkers. Be thankful for even the smallest blessings. “Whether you eat or drink, whatever you do, do all to the glory of God” (1 Corinthians 10:31). Great advice and written in a way that is encouraging. Thanks! Thanks Patti, glad you liked it!